An intense survival thriller, Lilli stars Samyukhta Menon as a pregnant woman abducted and locked up in a secluded location by a group of men. Among the long list of upcoming films made by newcomers is Lilli, which is scheduled for release in July. In a candid chat with Express, director Prashob Vijayan discusses the film, the current phase of independent cinema, and the inspiration for doing a film on his own. An intense survival thriller, Lilli stars Samyukhta Menon as a pregnant woman abducted and locked up in a secluded location by a group of men. "There have been many kidnapping movies but I don't think anyone has done before a kidnapping story involving a woman who also happens to be pregnant. When there is a baby involved, there is an additional level of risk and intensity. In a situation like that, when the woman is physically and emotionally weak, she will be giving more priority to her baby's life than her own. The stakes are much higher." The filmmaker didn't find it challenging to give directions to Samyuktha. "It's not that difficult when you have a detailed character description and properly planned scenes. We had lots of time and she did it really well. I think Samyuktha is destined to be a big star." Prashob says he didn't expect a big production company like E4E to come aboard. "They're keen on taking on interesting, subject-oriented projects made by new talents. First of all, our film has a miniscule budget, and second, I didn't have anything to show as a 'track record' -- nothing to impress the producers with. There was a time when you needed to have a track record before approaching someone. Now, things have changed. Today, all you need is a good script and you're on." It's a great time for independent filmmakers in Kerala right now, according to Prashob. "Just imagine trying to make your first film some 7-8 years back. It was the Internet boom: we were consuming plenty of information. We were bit by the filmmaking bug and wanted to do something. Our minds were stuck in the 80s and 90s. But in order to get a producer's approval, it was necessary to have some experience first." Prashob cites Chappa Kurish director Sameer Thahir as a major influence. 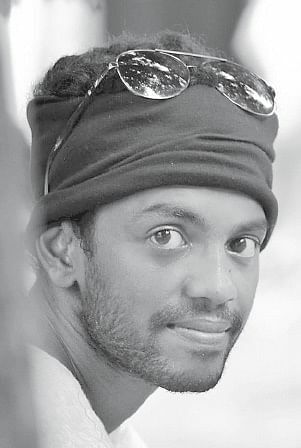 "Yes, Hollywood filmmakers like Christopher Nolan and Quentin Tarantino are big influences, but in Malayalam cinema, it was what Sameer Thahir did that opened up doors for guys like us. He didn't shoot that movie with a big camera; he shot it on on a Canon 7D and was able to screen it in theatres just like any other film. Before he came, you were required to shoot it on film stock, use lighting set-ups etc. He didn't do any of that. So, that solves the budget issues. It becomes a home-made industry. And despite the minimal treatment, he managed to cast an actor like Fahadh Faasil. That gave us an enormous confidence boost. I asked myself, 'If he can get Fahadh in a movie like that, why not us?'" A filmmaker with a good subject matter and well-written script doesn't have to worry about attracting viewers, believes Prashob. "Today, if you have a good story, producers aren't hesitant to support you. And they have to be convinced that you can do a low-budget film without comprising on quality. If your subject matter is good, even if there is no initial pull, these random theatre goers -- the ones who watch a movie just for the sake of watching something -- will give good word-of-mouth and help your movie. So you don't necessarily need big names to build buzz for your movie. Something like Angamaly Diaries or Shutter is a perfect example of this. They won critical acclaim despite the presence of newcomers."